The side of our house, with the porch gone! Removing the structure revealed some of the foundation issues we’re having. What the back of our house looks like now. You can see the cement stoop that was originally there. We would like to make this into a nice little patio area, by using patio stones and/or gravel. We’d like to have a place for a table and chairs and also a grill. I’m even thinking of that marking off the area with some sort of pergola and lighting would be really nice! Underneath the deck we found some containers that were full of water. Once we got rid of them, the mosquito problem was a lot less. However, it’s not completely gone. We are also having a wasp problem – we found 3 nests in the roof of the sunporch, so they are flying around trying to find new a nest. This makes it still hard to be outside. I’m also unsure about what to do with the fence. Ideally, I’d love to take down that section and put a new one in that follows the property line. I did some research, and it seems that with chain-link, just “moving” it over a few feet is not easy at all. Some of the research I’ve done says that it’s very worth it hiring a professional, versus DYI. Hmm, more money. Not sure. Paul thinks we should just leave as is. I am thinking of squatter’s rights laws, and I think that it’s important to have a fence on the boundaries of your property – for both you and your neighbor, and also for future owners of either house. If it was just crooked, I wouldn’t worry about it, but the whole jutting in thing makes a different in my opinion. Maybe we could just replace that section of the fence, though that might not be an option. Still thinking about it. building permits and bye-bye porch! 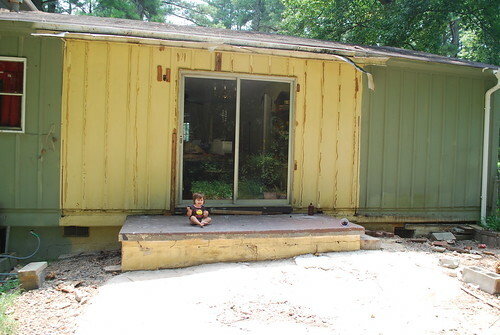 Last week, I submitted the application for a building permit to demolish our porch and sunroom. Hooray! It was a little confusing – the application assumed you were building something and not just demolishing it. I also had a scare when I got home and realized that I forgot to mention that there were electrical outlets in the porch. The lady processing the forms said something that made me think if the application didn’t exactly match the work being done, then we would be denied and have to start all over again. I tried to go back the next day and fix the application, but it was too late. On Thursday, I got a call from the Permits department at City Hall, telling me that the permit was approved and ready! I was happy – I thought we would get an inspection before it was approved, but I guess I was wrong. I did have to call the inspector to find out when he wanted to visit the property, and I was able to be honest with him about the electricity. He said to be careful, turn off the power, and that he would inspect it when we were done. Sweet! Friday night, Paul and my sister (who was visiting) took all the windows and doors off the room. My uncle came on Saturday and after working all day, got the room completely dismantled. It really looks different now! I can’t believe how much brighter our dining room is now. The deck looks HUGE! I can’t wait until that is gone too. My uncle is planning on coming back this week, depending on the heat – we’re having a heat advisory for tomorrow (supposed to be a real feel of 113! ), and of course I don’t want him working in heat like that! I have been taking pictures, but I am going to wait and post them when it’s all done. Paul and I went today and bought vertical blinds for the sliding glass door. I guess we need them now, since there isn’t a room beyond. :-) We’ll hopefully hang them in the next day or so. We’ve never hung blinds before, so this will be an experience! We got our land surveyed yesterday! 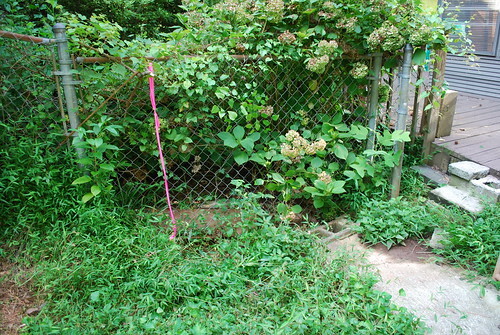 I’m so happy to know exactly where the property line is, and now we just need to figure out what to do about our fence. The fence along the back (?) of our property is true to the line; we’ve never questioned that. The fence that runs up the side yard in between us and our neighbors is the one in question. 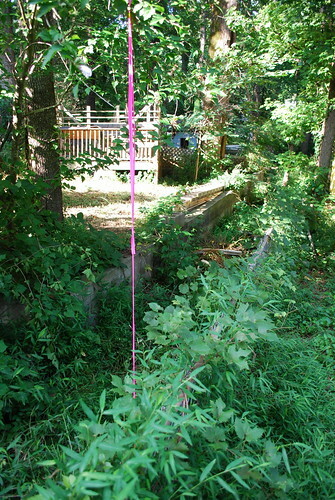 From what the surveyor said, it starts out on the property line, and then slowly deviates. Not sure if this was intentional or just poor planning on the original owners’ part. By the time it gets past the house, it’s quite a bit off. The piece of fence that the pink thing is tied to belongs to our neighbor. Our fence is the post on the far right. I think you’d have to see it to understand what’s going on – it’s so hard to explain! But yeah, you can see how far over they are – and if we’re able to restore the fence to its correct position, it would really help with the water flow. So, some updates on what’s going on as we try to move forward with our immediate plans. I found out that we do need a permit from the city to demolish the add-on. I got the necessary paperwork and will be filling it out today. I hope the permit isn’t too expensive. I called around and found that there’s no official documentation of our property lines. One option was to rent a metal detector and see if we could find the metal stakes that surveyors usually bury in the ground. However, because we’re pretty sure the neighbor’s fence is partly on our property, we decided to go ahead and pay for a survey so we could be sure before we approach our neighbors. I set up a survey for Monday. Yikes, that was more money that we didn’t expect to spend, but such is life, isn’t it? Once the survey work is complete, then we will apply for the “building permit”. Once we’re okay with that, we’ll get my uncle to start taking down the porch. In the meantime we’ll start stripping the porch of things that we want to Freecycle. Here’s the plan for the rest of the summer, hoping to complete this before it gets cold in the fall. I’m praying that we have enough money. Grade the backyard and put in sod. (Will get quotes from landscapers for this after the foundation is taken care of.) This is essential to fixing the water problems because our backyard dips in the middle of the yard, so the water can’t naturally flow to the creek that’s behind our yard. This will take care of the foundation problem, and also the water problem. (And taking care of the latter will help prevent future foundation problems!) 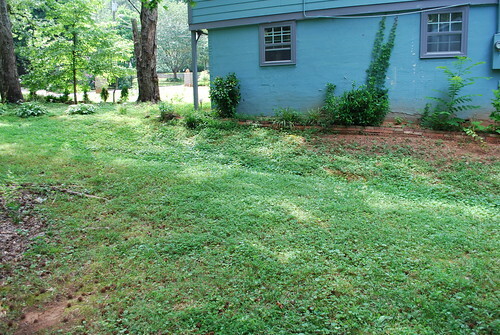 An added benefit is that we’ll be able to actually enjoy our yard, free of mosquitoes and weeds. I’m really excited about these projects! I hope it doesn’t take too long to complete this list! And I hope we don’t have too many unexpected expenses, because already we are cutting it tight. (And having a $526 after-insurance hospital bill doesn’t help!) One potential expense is our fence – I’m hoping we can continue to use what is up right now (not sure how that works with grading the property, etc. ), but I don’t want to ignore the possibility of having to replace it. Today we got the first estimate for our water drainage problem. The guy was nice, but in some ways made me feel stupid. He kept commenting on the negatives of the house – like how it is situated on the lot. We’re on a corner lot, and the front of the house is facing the corner, so it is angled to the street. 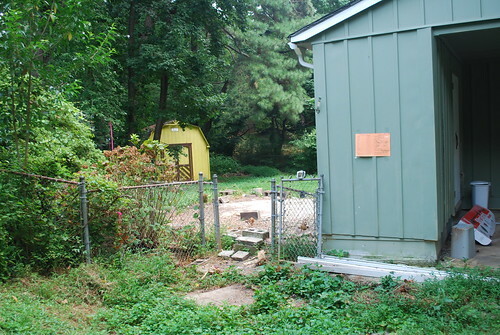 The house is also sitting on the edge of the lot, so we have a HUGE side yard, a virtually nonexistant side yard on the other side, and a small-ish backyard. It wasn’t the most well-thought out plan. He said, “Did you know that when you bought it?” I was thinking sarcastically, no we bought the house sight unseen! Sheesh. Anyways. First off, here are pictures to show better the problem, as I explained to the landscaper today. This is a bit hard to see, but this is our neighbor’s yard. You can see how their house sits a bit higher, and the water has been flowing from their front yard to a little ditch, which heads straight to our house. This is where the water ends up. You can see all the wild violets – they grow in moist soil, so wherever you see them in our yard is where the water is flooding. Previous owners stuck cement here to try and fix the problem, but in fact just made it worse. You can also see the deck and the porch on the back of our house. This was a poorly-constructed add-on, and goes right up to the fence. I’m pretty sure that’s not allowed, but it was probably built before they had such laws. 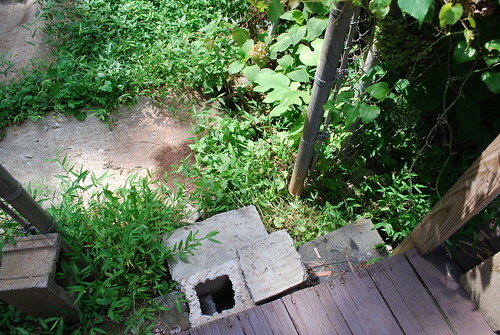 This is a really narrow area between the edge of our house and the neighbor’s yard, where all the water is diverted. They have put boards up on the inside of their fence to push the water into our yard. Yep, this is how close the stupid deck thing is to the neighbor’s yard! That space is too narrow to get into and dig a ditch. Our backyard, taken from the deck. There is a retaining wall of sorts made from cinder blocks that is falling over. The back of the property is higher than the middle, so the water pools in front of the shed. 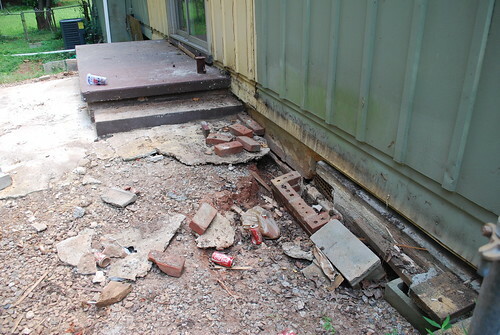 It’s also going under the porch where we can’t access and getting into the crawlspace. Behind our property is a dry creek bed where we can send the water, once we figure out how to get it. The shed is a bit in the way, though. The landscaper had two ideas. One was to install catch basins and pipes. He was unsure how easy it would be to send through that narrow area and under the porch. The other idea appealed to me a lot. He said they could demo the sun porch and deck, grade the whole yard, make a natural runoff for the water and put in grass. We have no love for the sunporch. It’s a nice concept, but it was poorly made and we never use it. The floor is very bowed – getting noticeably higher and lower at different areas. And most of all, I *hate* that it is so close to the property line. 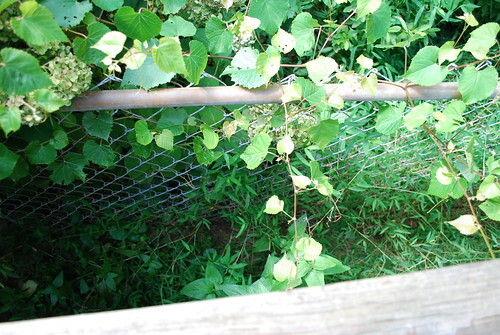 It’s very hard to control the weeds that spring up in the hard-to-reach areas, and so it looks a bit trashy. Doing this would solve a lot of problems. First off, it would clean up the backyard and make it useable. Second, it would take care of the water problem. Third, those two things would really help with the terrible mosquito problem. 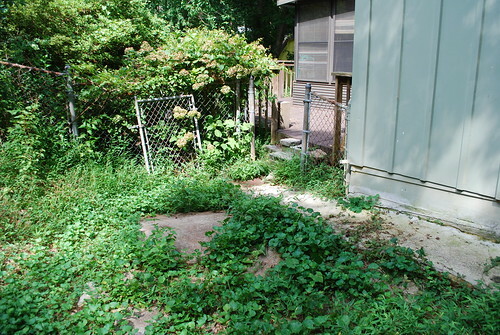 Right now, the backyard is 100% weeds (including poison ivy), full of bugs, and pretty much unusable. I have a dream of being able to have Savannah spend time outside, but in the current state it is impossible unless I bathe her in bug spray. Another (minor) issue is my dislike for that huge yellow shed. It takes up a lot of room and doesn’t even sit at the back of the property. It’s much bigger than we need, but it’s in good condition. I would like to get rid of it and get a smaller shed for our garden items (lawn mower, etc.) 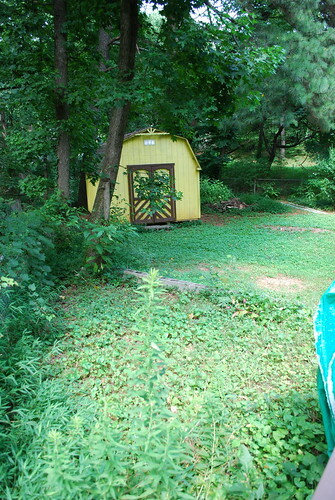 and perhaps put the smaller shed in our huge sideyard. So while we’re at it, we might as well get rid of the shed! After the landscaper left, I mentioned on Facebook about the possibility of demoing the porch. My uncle and cousin saw, and offered to help us out! My uncle is a handyman and has done several other things for us. 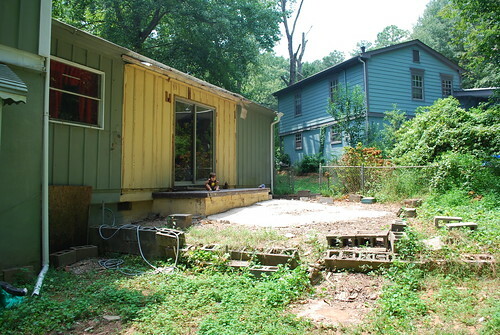 He is coming tomorrow to give us an estimate for demoing the porch and subsequent grading and landscaping work. I would love it if this worked out, because he is willing to let us be more hands-on with the project and teach us. We are willing to do work, but lack know-how, so we feel that we have to hire a professional. Tomorrow I am going to City Hall to inquire about building permits and all that jazz. We also have another company coming tomorrow to give us an estimate. They deal with not only water problems but also foundation issues, so we’ll see what they have to say! I am excited about moving forward with these projects. Of course we’ll be broke after it’s all said and done, but it will be two very big things taken care of.